We can only see with our own eyes. With practice, the visible spectrum of our eyes might be widened; but never can we see with someone else’s eyes. 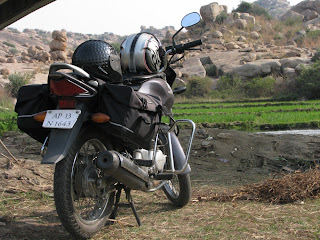 I, along with my brother, rode down to Hampi over the past weekend. Surprisingly, I could not find driving directions from Hyderabad to Hampi on Google Maps! On travel forums also, I could only find very old posts (all posts were more than 2 years old). Hence here's the log of what I did to get to Hampi by road. There are two routes to Hampi, as mentioned in this Team-BHP discussion. First route is Hyderabad -> Mahboobnagar -> Raichur -> Sindhanur -> Gangawati -> Hampi. Apart from the first 80km from Hyderabad, throughout this route we have only state highways (i.e. no national highways). Second route is Hyderabad -> Gooty -> Guntakal -> Bellary -> Hospet -> Hampi. Most of this route is through national highways. Of these two, I chose the first route (via Raichur). Although I usually prefer national highways, this time I chose state highways because a lot of people say that the roads near Bellary are very very bad. And, I really liked the route I chose. Yes, there were speed bumps on the road; there were villages on the road; there were cattle crossing the road; villagers just didn't expect us to be passing by at a high speed. Those are all negative sides of this route. However, the roads were very good between Hyderabad and Gangawati: we could cruise between 75 and 85kmph on our Unicorn. I liked the roads because they were not deserted like our new highways. I could see a lot of agriculture lands on the sides. Plus, I am a fan of two-way roads, and for me the new highways are boring after a while. Google Maps has directions only till Gangawati. After Gangawati, you should ask the locals for directions. However, while returning, Google Maps gave us directions! All I had to do was find directions from "My Location" to Hyderabad, and it gave me the directions. Pictures from the trip can be found in my Picasa album. When you're on the pillion, you cannot understand why the rider does certain things. Just trust the rider and be confident. Saw a snake crossing the road in Hampi. This was the first time I saw a live snake very close (not counting zoos, of course). Summer has already started in South India. The moment bike stops the mind starts to think, "when am I getting rid of the gears?" When you open a new application on Facebook, you have to approve the app to access your information (by clicking on the "Allow" button). If you don't, you cannot use the app, so it's essential that you approve the apps that you want to use. However, if you approve application X today, Facebook will remember that approval forever! So, if you don't use some apps anymore, revoking access to them is a good idea. First, open Application Settings page of Facebook. Select "Granted Additional Permissions" from the Show dropdown list. Offline access: Any app that has offline access to your information can access your profile, friends, etc. even when you are not using the app. Although it's not likely that an app would do it, technically it's possible for an app with such an access to periodically read your friends list and gather information without your knowledge. You don't have to open that app. You don't even have to open Facebook, for that matter. You might want to remove this access to all apps that you don't use anymore. Email: Apps that have this access can spam email you whenever they wish to. Remove the apps from which you don't want to receive emails. In my case, Likeness app has offline access and the ability to post whatever it likes as my news update. I don't really use Likeness app. So I revoked access by clicking the "x" near its name. People in the real world know only as much about me as they need to know. I like to keep it the same way with machines too. If I don't use a Facebook app, it shouldn't have access to my data. It may so happen that a Facebook app has a bug and that lets some evil people access other people's data. I don't want to be a victim when something like that happens. Minimizing the number of apps that has access to my data means I am minimizing the surface through which my information can leak. I'd like to keep it as small as possible. Of course, you would have your own reasons. Maybe now is a good time to review the apps that have access to your information.